It all starts with the order that the judge signed. Review it. When reviewing the order granting your occupational license, you will find various restrictions and requirements. Restrictions typically limit your time, location and purpose of travel. In some scenarios, people are restricted to use an occupational license only when driving a vehicle equipped with an ignition interlock device. Other requirements can vary. They often include (but are not limited to) keeping a travel logbook, no traffic citations, no radar devices, etc. Specifically, however, Texas Transportation Code Section 521.245 requires the judge to require the person attend some form of an alcohol dependency program in the order granting occupational license. The order can also require you to submit proof of attendance to the court. 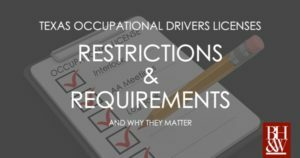 What Happens if Fail to Follow The Occupational Drivers License Restrictions or Requirements? …..(2) fails to have in the person’s possession a certified copy of the court order as required under Section 521.250. (c) On conviction of an offense under this section, the occupational license and the order granting that license are revoked. What about not complying with the requirement for attending an alcohol dependency program? Per Texas Transportation Code Section 521.245, judges have the authority to revoke the occupational license and impose an additional 60-120 day suspension. That additional suspension is costly, too. Unlike the original DWI ALR suspension where you could apply for an occupational license, there is no option for another occupational license if you were granted one and failed to comply with this requirement. Have a certified copy of the order granting your occupational license. Read it carefully and educate yourself about the restrictions/requirements involved. Comply with said restrictions/requirements for the duration of your occupational license. If you have questions about your occupational license, contact your attorney for assistance. If you don’t have an attorney, the attorneys at Barnett, Howard & Williams, PLLC are only a phone call away.